The Leipzig-Miami Exchange Program promotes the scholarly exchange of ideas between students and faculty from Miami Law and the University of Leipzig in Leipzig, Germany. Students and faculty members from both law schools meet twice a year (January or February in Miami and May in Leipzig) to discuss ten topics relating to law or policy. 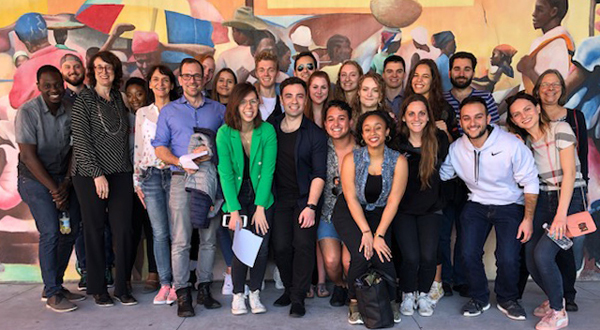 Each Miami Law student is paired with a student from Leipzig to collaborate on a presentation incorporating both German and U.S. legal perspectives. Miami Law students also write one research paper. Although academics are an essential part of the exchange, the program also includes social and cultural events organized by the host faculty. The first exchange took place in 2001 when Professor Richard Williamson was a Fulbright Professor at the University of Leipzig and was further developed by Professor Emeritus David Abraham. Current faculty advisors for the program are Professor Donna Coker, Professor Mary Anne Franks and Professor Rebecca Sharpless. Students are encouraged to contact the faculty advisors with questions about the substance of the exchange program. Questions regarding logistics should be directed to Detra Davis Fleming: ddavis@law.miami.edu. Miami Law students must participate in two sessions and make an oral presentation during each session on the U.S. perspective on a topic selected by the faculty. Law students from the University of Leipzig present the German perspective on the same topic. All presentations and discussions are in English and open to the university communities at both institutions. All students are active participants throughout all of the discussions. Students receive 2 credits in the spring semester. They are required to participate actively in the program and to complete a short paper for the workshop. The program can also be used to fulfill the upper level writing requirement by taking an additional credit and writing a substantially longer paper on a workshop-related topic. All papers are supervised by the program faculty, often in collaboration with other Miami Law faculty with relevant expertise. Students apply in the fall semester. The deadline to apply for the 2018-2019 program is November 12, 2018. The Leipzig students visit Miami in January or February and Miami Law students visit Leipzig in May soon after law school graduation. The exchanges typically last three days and four nights. Students contribute a portion of the airfare cost and any increased cost due to personal travel. The two sponsoring universities cover the rest of the airfare, train travel to Leipzig from Berlin, lodging, most meals, and some entertainment. International Exchange Student Handbook - A comprehensive guide to helping international students prepare to spend a semester at Miami Law.